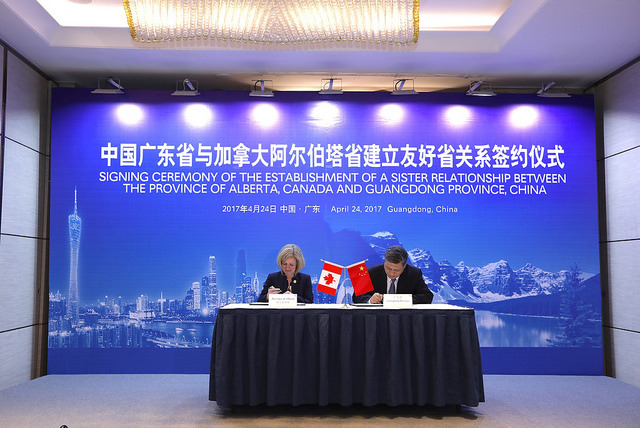 Government of Alberta - Alberta and the province of Guangdong in southern China have signed a landmark agreement to strengthen ties and facilitate trade between the two jurisdictions. Premier Rachel Notley signed the agreement on behalf of the Government of Alberta in Guangzhou, the capital of Guangdong. Governor Ma Xingrui signed on behalf of the Guangdong government. The sister-province relationship agreement has significant implications for increased trade and investment between both provinces. Specifically, it creates the conditions for the governments of Alberta and Guangdong to work more closely on areas of shared interest, including trade and investment, and highlights the special relationship between both jurisdictions. Guangdong represents 25 per cent of China's total imports and exports and is the largest recipient of foreign direct investment in China. Approximately 20 per cent of Canada's exports to China go to Guangdong, making it the No. 1 provincial destination in China for Canadian exports. To leverage the growing opportunities in the area, Economic Development and Trade Minister Deron Bilous opened the Alberta Guangzhou Office in March 2016. Other efforts to expand the Alberta-Guangdong relationship include Minister Bilous’s participation in a trade and investment seminar in Guangzhou in November 2016. The seminar featured more than 80 Alberta companies and economic development associations. Sister-province relationships are multi-faceted arrangements that help promote economic development-related activities, as well as cross-cultural awareness and cooperation in culture, education, sports, agriculture, technology, governance and tourism. Alberta has also been in successful sister-province relationships with Gangwon, South Korea since 1974, with Hokkaido, Japan since 1980, and with Heilongjiang, China since 1981. The relationships have led to a variety of partnerships across sporting, educational and cultural events, as well as in research and business ventures. Each of Alberta’s sister provinces expressed their concern during the Fort McMurray wildfires last spring and contributed to Red Cross relief efforts.